In recent years, the debate over illegal immigration has often been posed as a choice between two competing priorities—increasing border security and stronger enforcement of the nation’s immigration laws versus providing a path to citizenship for immigrants who are in the U.S. illegally. Latinos are nearly twice as likely as the general public (42% versus 24%) to say priority should be given to providing a path to citizenship for the nation’s unauthorized immigrants. When it comes to better border security and stronger enforcement of immigration laws, the general public is nearly three times as likely as Hispanics (29% versus 10%) to say this should be the priority for dealing with illegal immigration. Even so, there is some common ground between Hispanics and the general public. Some 46% of Latinos and 43% of the general public say both better border security and enforcement and a path to citizenship should be given equal priority when it comes to dealing with illegal immigration. 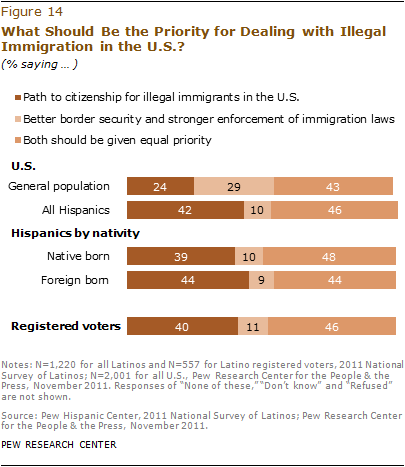 Overall, there are only minor differences between foreign-born and native-born Latinos in their views about the policy priorities for dealing with illegal immigration. Fully 84% of Latinos favor granting in-state tuition to unauthorized immigrants who have attended high school in their states and have been accepted at a public college. By contrast, the general public is split—48% support in-state tuition for unauthorized immigrants, while 46% do not (Pew Research Center for the People & the Press, 2011b). Support for in-state tuition for unauthorized immigrants is greater among foreign-born Hispanics than native-born Hispanics—90% versus 77%. Nonetheless, large majorities of both groups support such laws . More than nine-in-ten (91%) Latinos support the Development, Relief and Education for Alien Minors (DREAM) Act, a proposal to grant legal status to unauthorized immigrant children if they attend college or serve in the U.S. military for two years. Few differences by nativity are evident. 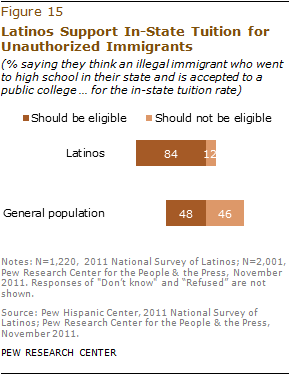 Fully 87% of native-born Latinos and 94% of foreign-born Latinos support such a law. Latinos who are not U.S. citizens or legal residents show the most support for the law (96%).